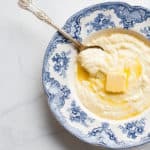 How To Make Grits Recipe - What are grits and how do you make them? Check out this recipe for perfect creamy Southern Grits that are amazing for breakfast, brunch, lunch and dinner. Add half and half and water to a large pot over medium high heat and bring to a boil. Add some salt to salt liquid. Once liquid starts boiling, briskly stir in grits and bring heat down to low and cover with lid. Cook according to instructions on back of package (about 20 for stone ground) stirring twice during this time to maintain smoothness. They should be completely tender and thick. Once ready, stir in butter, heavy cream and season with salt to taste. These can also be done with Quick grits in a pinch. It takes about 5 minutes to make.